For very experienced divers who want a challenge and are willing to accept the risks involved, diving out toward the tip of the Newport South Jetty can be a rewarding experience. However, diving the jetty tip is not to be taken lightly or tried in anything other than ideal conditions. There are very real dangers present that even the most experienced diver can be caught by surprise in very unsafe situations. Those who do attempt this dive will be rewarded with more macro marine life (lingcod, rock fish, crabs, etc.) than on the five fingers further in the Yaquina Bay. We know some SCUBA divers who like diving the jetty tip to spearfish and crab. The jetty tip of the South Jetty in Newport juts out into the Pacific Ocean to allow ships to pass in and out of Yaquina Bay over the bar. Only the most experienced divers should try diving the jetty tip in ideal conditions. The main highlight of this site, in our opinion, is that not very many people dive it. Not very many people dive it for a reason though. You need to be very confident in your skills and dive this site in ideal conditions. We have never made it all the way to the tip of the jetty but we know people who have. Someday when conditions are right, we will go for the jetty tip. Until then, we can report to you what we have seen and what our SCUBA friends have told us about conditions on the jetty tip. We have seen plentiful lingcod, perch, rockfish, and crab along the outer part of the jetty on the way to the jetty tip. It is a good place to spearfish or crab because not many go this far out to do those activities. However, fishermen and hobby crabbers do go out in the jetty so be mindful of lines. 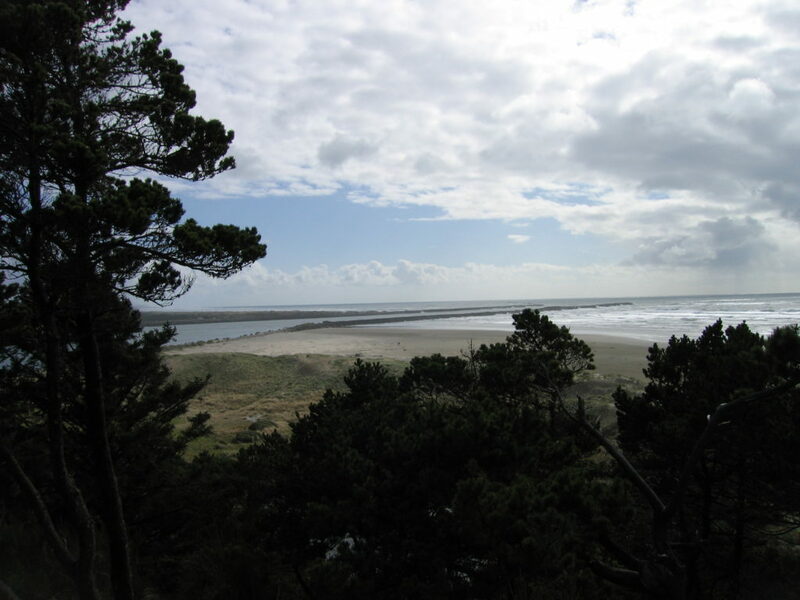 Take the aquarium exit from US101 and then follow Southwest Jetty Way toward the ocean. Go to the very end of the road and find a parking spot. There is a lot of parking at the end of the road although sometimes it fills up with fishermen, surfers, and people enjoying the beach. There is some parking a little further back toward Newport although you’ll have to walk a ways depending on which entrance you want to use. Imagery ©2017 Google, Map data ©2017 Google. 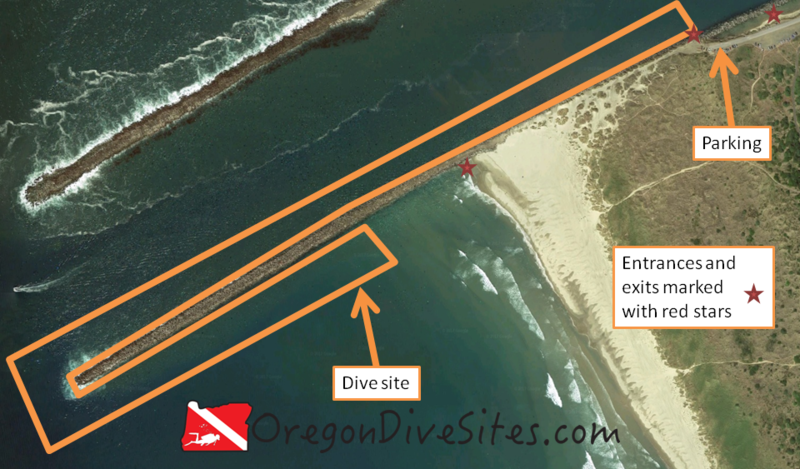 Diving the south jetty tip in Newport is a challenging experience that must be done in the right conditions. This site runs roughly west from the entrances. The further out you get, the rougher the conditions you will encounter. We have only one about halfway out to the end of the jetty tip ourselves because conditions have been too rough for us otherwise. Boat traffic goes up and down the channel regularly. It might be wise to fly a dive flag. We have one that we love and use when we go SCUBA diving in Oregon. Maybe 100 feet off the tip of the jetty there is a deep hole where water currents swirl around. Unless you really know what you’re doing, we don’t suggest checking it out. Most people climb over the jetty rocks into the channel at the parking lot. Some people enter further up toward Newport by the fifth finger. You can also do a surf entrance on the south side of the jetty along the beach. The south side of the jetty is usually pretty shallow but if your goal is to reach the tip, the walk down to the water’s edge will save you a surface swim or bottom time. This is usually done as a shore dive although a boat could drop you off at the jetty tip. Boaters need to follow the rules with respect to the channel. A good captain is highly recommended. Normally the jetty tip cannot be dived safely. It is usually much too rough and with much too strong of a current to go out to the very end. The inner part of the dive site that is more protected from the open ocean is more diveable when the ocean is acting up. However, we strongly recommend you dive this site in advance of high tide so that you are pushed back into the bay rather than sucked out into the ocean. You could also time your dive to start with the very tail end of the tide going out so that you will be pushed back in with the start of the high tide although visibility won’t be very good. Surf, surge, breakers, boats, fishing lines, crab pots, and general rotten conditions are often found at the jetty tip. Look at conditions at the end of the jetty before you make the choice to go out there. Walk out to the end and look with your own eyes to see if you like what you see. Be prepared to abort the dive and turn around if conditions deteriorate. There is no glory in being a dead SCUBA diver. On the inner part of this dive site, we have experienced up to 30 feet of visibility depending on ocean conditions. Usually you’ll find the visibility around 15-20 feet. The bottom is all sand so there are no worries about stirring anything up. If you start to get sucked out to sea, you may need to crawl along the bottom so the bottom being sand is a good thing. Water temperature is exactly the same as the ocean. Expect between 45F and 55F depending on the time of year. There is no best time of year on this site. You can only dive this site when the sea is calm. Any other conditions will result in a very bad day for you. Turn around if conditions deteriorate and live to dive another day. If you look off the very tip of the jetty, you can find about 60 feet of depth. However, most of the site is around 20-30 feet. This site requires advanced training and a very seasoned buddy pair of SCUBA divers. At the minimum you need advanced open water training. We recommend drift diver training. We also recommend extensive experience with surf, surge, and strong, unpredictable currents. Taking along a safety sausage or other distressed diver indicator is highly recommended. We carry safety sausages with us no matter where we dive and we suggest you do, too. Our favorite is listed on the Gear We Use page. This is an advanced dive. You should not attempt this dive unless you really know what you are doing and conditions are right. There is an entrance right by the parking lot where you climb over and down the jetty rocks. The entrance is hard. A 1000 foot walk down the jetty and onto the beach leads to a surf entrance. Depending on which way the waves are coming in, this might be a calmer entrance. Back toward Newport, some people prefer to enter near the fifth finger by climbing over the jetty rocks. You can start diving immediately on the north side of the jetty. On the south side, a 300 foot surface swim will get you to deeper water where you will experience slightly less surge. If you want to reach the tip from the north side, we suggest a lengthy surface swim (1000+ feet) to get out a ways before you go down in order to conserve air. This is a no screwing around kind of dive site. ONLY dive here if you really know what you’re doing, you are willing to assume the risks, and the conditions are right. You can easily get sucked out to sea, bashed up on the rocks, or run over by a boat. DO NOT TAKE THIS DIVE SITE LIGHTLY. There is a local dive shop in the South Beach area of Newport that has an air fill station, gear rental and repair, and a limited selection of SCUBA gear for sale. Both the north and south bayfronts have a wealth of good restaurants and brewpubs. The South Beach State Park campground is a good place to camp. The yurts are a great idea in cold winter months. We have not tried any of the hotels in town. If you have and know of one that is diver friendly, please let us know!